When is the last time you watched a concert without touching your cellphone? Most of us can’t recall or perhaps never considered the possibility of being fully present and in the moment while watching an artist perform. In this day and age, it has become normalized to live life through a camera lens, but despite all of this, A Perfect Circle cultivated a fully attentive audience Monday night October 29th, 2018 at The Fox Theatre in Atlanta, Ga through not only their sound, their mood, or their lighting, but also through their unique “no cellphone” rule that was strictly enforced throughout the duration of the evening. To those of you who are familiar with Maynard James Keenan, whether it is through A Perfect Circle, Tool, or Puscifer, this came as no surprise. Matching the balance of cool toned songs were the blue lights that beamed from the back of the stage followed by heavy tones of red and orange as the mood morphed and grew deeper. Adding to the mood of the performance was the band’s unique stage presence with Maynard James Keenan kept mostly in the dark on a riser nestled towards the back of middle stage. He was truly “a voice among the many” as his vocal talent resonated from the dark of the stage. Typically, a performer kept in the dark would be a turn off, but this distinct style added to the atmospheric effect of their traditionally haunting music along with the mystery and secrecy already felt by our inability to virtually share the experience. With the lack of visual interaction, the raw talent of Maynard’s vocals and his band were fearlessly showcased. Regarding the dark nature of the stage, it has been stated on several accounts that Maynard has an eye condition that is affected by the strobe lights. To potentially accommodate this condition all of the lights seemed to come from the back of the stage and shine across the crowd as opposed to illuminating the artists, this is due to the fact that if not tended to properly, the lighting could potentially cause Maynard to pass out on stage. Regardless, it provided an incredible effect. True fact or not, here is a short statement found on the Reddit community that discusses the topic. 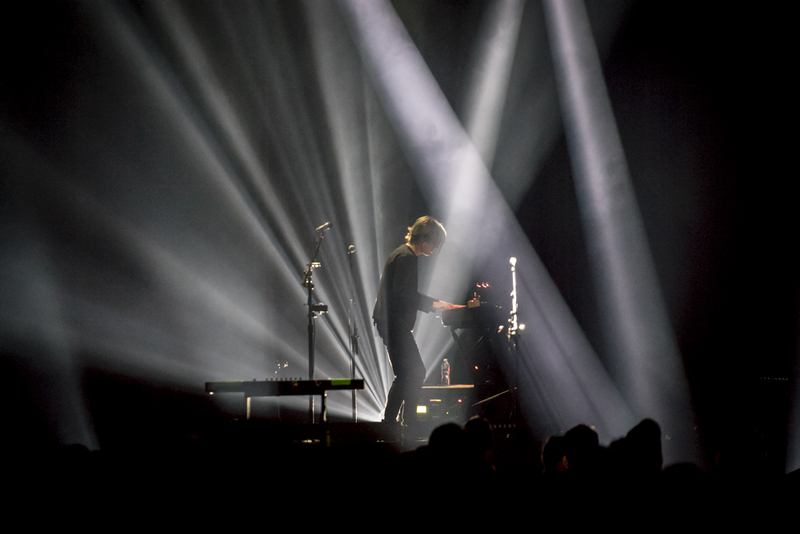 With that said, those who are familiar with Tool know that artwork and lighting are all the rage not only in their iconic music videos, but also in their live performances. 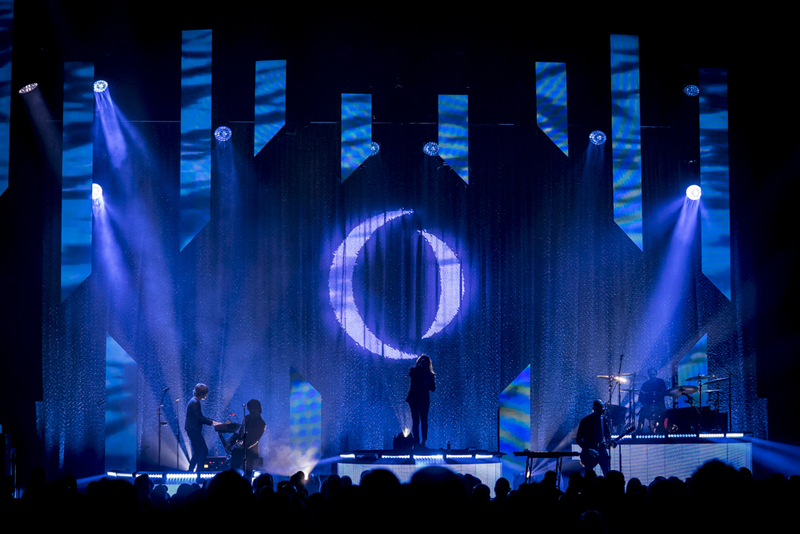 A Perfect Circle is nearly the opposite as they portrayed minimal elaborate images and stuck to more textural graphics such as water and even what appeared to be velvet. Its easy to say that this show was atypical for what a standard concert goer might expect with its lack of crowd engagement or hype statements, but it works for APC as they put on a more theatrical performance that featured an eloquently constructed set-list allowing the audience to feel more as if they were viewing an actual piece of art as opposed to just a collection of songs. It is no doubt that each contributing member to not only the band, but to the entire performance is an artistic mastermind from Vocalist Maynard James Keenan, Guitarist Billy Howerdel, Bassist Matt McJunkins, rhythm guitar and keyboardist James Iha (touring rhythm guitarist and keyboardist Greg Edwards), and drummer Jeff Friedl, but also the lighting technicians, and set constructors. A clear tell-tale sign of a powerful performance is the in the lasting affect that it has on its audience members and I personally haven’t stopped thinking about or feeling inspired by the performance since the show ended. I do wish I had some video of the performance to look back on and enjoy, but I also believe that not being able to record the show allowed it to create more of an impact on my overall experience and I can only assume that it is the same for those who also attended. Surprisingly though, at the end of their closing song, Delicious, Maynard called for security to “stand down” and gave the crowd permission to pull out their phones as he promptly exited the stage. Classic.